The following is an original and extraordinarily nerdy rendition of the classic Clement Clarke Moore poem adapted by yours truly, describing the basic pathway of happiness one feels when one sees a pleasant image—like Santa Claus! A vision of St. Nicholas—red, so jolly, and bold. Before the optic chiasm crosses in an unexpected swerve. Of six alternating layers; a complex neural highway. But what follows leaves even the greatest minds perplexed. Conversion of molecule to emotion—a feeling so intense. A group of tiny neurons on the floor of the midbrain. For from VTA to nucleus accumbens dopamine is fired. Pleasant emotional perception for every girl and boy. 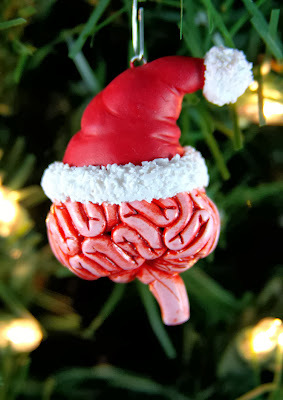 "A brainy Christmas to all—now, onward, reindeer!"